Govt fails to frame small sand mining lease policy To provide relief to real estate sector, state govt in its Budget announced to grant small sand mining leases through auction. But the mining department had not devised any policy to grant these small sand mining leases. Short on sand, real estate developers face penalty threat Faced with the unprecedented crisis of construction sand, in June 2018, the real estate developers sought relaxation in the prescribed deadline for completion of their projects registered with Real Estate Regulatory Act (RERA) saying that there was no provision to address such a situation. According to the real estate developers body, short supply of construction sand had slowed down the construction works by almost 50 per cent. BJP MLA supports mining in Chambal Gharial sanctuary In June 2018, Bhawani Singh Rajawat, the MLA from Ladpura in Bhilwara district came out in support of villagers who illegally mine sand from River Chambal saying it doesn’t matter if “fish-eating crocodiles die” but no human should be allowed to die by putting a ban on mining. This was not the first time that Rajawat has espoused killing crocodiles and gharials. Terming the reptiles a menace, the MLA had in 2016 recommended shooting of the ones that stray into human habitats. 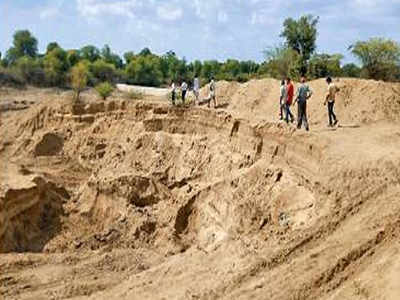 Villagers complain of non-compliance of NGT order Disappointed by the unabated mining activities in spite of the directions of the NGT to stop them with immediate effect, the villagers of Karwar near Jodhpur submitted a memorandum to the district magistrate demanding an immediate compliance of the tribunal’s directions in Nov. 2018. 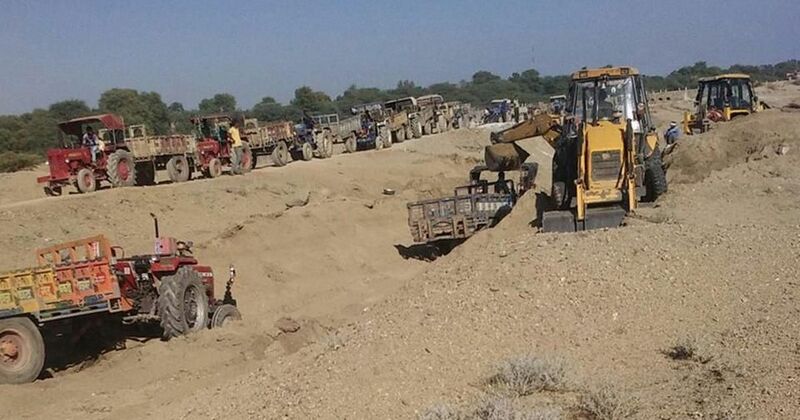 10 arrested, trucks seized for illegal sand mining Jaipur police arrested 10 persons and have seized 12 trucks and four tractor trolleys carrying the illegally mined sand from various police station areas in the city during early hours of May 18. As per police the sand was mined from the Banas river belt. The caught trucks and vehicles were handed over to mining department for further action. Manufactured Sand M-sand alternative to bajri: JDA to developers In April 2018, the Jaipur Development Authority (JDA) and developers started looking for manufactured sand (M-sand) as an alternate to be used for construction in new projects. For the upcoming projects, the JDA in the terms and conditions of the tender documents, had planned to use M-sand. Many developers urged that to gain confidence of residents and developers the state govt should set up a monitoring body to look at the quality of M-sand manufactured and supplied in the state. PCB to study if sand could be manufactured from mine waste Following SC ban, Rajasthan is exploring alternatives to sand mined from rivers illegally and unsustainably. The State Pollution Control Board (RSPCB) formed a committee comprising officials from the pollution board and mines and geology department to study the ways to manufacture sand from minerals and mineral wastes to replace river sand used in construction purposes. The committee was to suggest ways to overcome environmental problems and was to submit its report on May 24. JDA permits use of M sand in infra projects Dearth of construction sand had hit not only the construction companies but also the infrastructure development. JDA while floating tenders for elevated road and overbridge at Jhotwara permitted use of manufactured sand instead of bajri. The price of M sand was higher apart from logistic challenges. Mining dept organize workshop on M-Sand In July 2018, the department engineers presented a model of M-Sand, as a substitute for the river sand during a conference on ‘Manufactured Sand as an Alternative to River Sand’ held at Rajasthan Institute of Public Administration organised by the RSPCB in association with the department of mines and geology (DMG). Information shared by the DMG said that state required 37 million metric tonnes (MMT) of sand every year for its infrastructure projects. “The estimated reserves of raw material for manufacturing M-Sand is 800 (MMT). The department has already identified districts/regions which has reserves (raw material) available,” said MS Paliwal, geologist and Superintendent Vigilance in Udaipur. Explaining how this sand is manufactured, Paliwal said that sand is produced by crushing of rocks, quarry stones into a size of 150 microns. The crushed material is segregated and can be used for different purposes depending on size and composition. “The sand obtained through this process is washed to remove impurities making it a durable and ideal for all forms of construction purposes,” said Paliwal. Policy to regulate M-sand on cards The new govt in Jan. 2019 is learnt to have started exercise to give legal framework on M- Sand production, supply to meet the growing demands. The CM Ashok Gehlot on Jan. 7 has issued instructions to mines officials to give a legal framework on m-sand production by drafting a policy within a week. Sand mining ban to continue Refusing to give any relief to the state govt. on the ban on sand mining, the SC on Jan. 8, 2018 said that its ban order would remain in force for another 6 weeks until the MoEF granted environmental clearance to mining on the basis of replenishment studies submitted by mining lease/ quarry holders. The apex court was not satisfied with the affidavit filed by the state chief secretary and asked the state govt to file another one. The court had taken the state govt to task over five mining approvals given on agricultural land against the apex court order. ‘Do you have a policy to stop illegal sand mining’: SC The SC on Feb. 23, 2018 expressed its concerns over the possible drying up of rivers as a consequence of rampant illegal sand mining. The bench comprising Justices Madan B Lokur and Deepak Gupta, was hearing a clutch petitions on the illegal sand mining in Rajasthan. No relief in sand mining ban It was a double whammy for the state govt in the sand mining case on March 23. While the SC refused to give any relief to the state govt, the Rajasthan HC too stayed the notification for e-auction of 31 sand mining leases issued to tide over the shortage of sand. Postponing the matter to April 2, the apex court observed that if the illegal sand mining is allowed to continue in its current pace, it will turn into a tunnel between India and China shortly. The HC meanwhile ordered an interim stay on the March 15 notification for mining at various locations in Jhunjhunu, Jaipur, Dausa, Ajmer, Bhilwara and Chittorgarh and gave direction to initiate suo motu contempt proceedings against principal secretary (mining) and director (mines and geology). The HC order followed a writ petition filed by one Bharat Singh Shekhawat who challenged certain conditions in the e auction. The notices were returnable within two weeks. Failed to prevent illegal sand mining: Govt to SC In May 2018, the state govt accepted before the SC that it had failed to prevent illegal sand (bajri) mining going on in the state even as it failed to get any relief from the apex court. The state govt repeated in its plea that not only the bajri mining ban had created a new mafia, but many important projects were hit. SC refuses to dilute ban In Aug. 2018, the apex court refused to dilute the total ban on sand mining and listed the matter for Nov. 19 as the next date of hearing. Earlier, HC had stayed the govt’s attempts to have new rules to grant mining lease on shorter plots treating it a contempt of the SC orders. The govt was learnt to be working towards following Madhya Pradesh’s footsteps in giving mining rights to the panchayats, but it was yet to be seen if that model too satisfied the SC’s instructions. Stop illegal mining in Aravallies in 48 hrs: SC In Oct. 2018, SC directed the state govt. to stop illegal mining in a 115.34-ha area in Aravalli hills within 48 hours. A bench comprising Justices Madan B Lokur and Deepak Gupta said it was compelled to pass the order because Rajasthan had taken the issue “very lightly”. 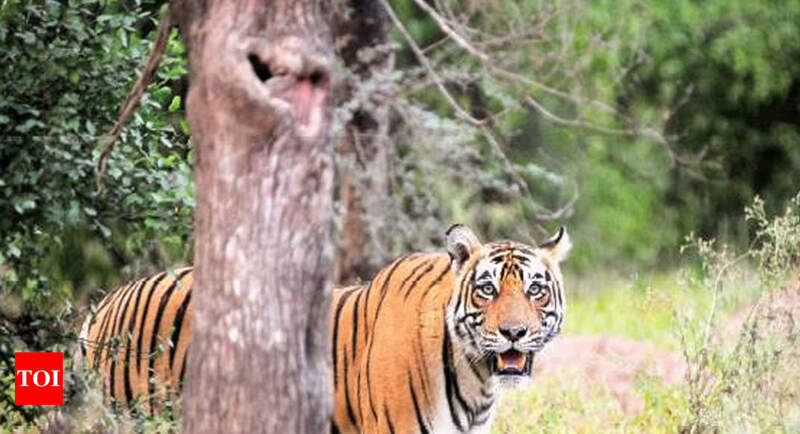 NGT bans mining near Sariska Tiger Reserve In Dec. 2018 the tribunal directed all mining activities in the eco-sensitive zone (ESZ) of the Sariska Tiger Reserve (STR) to be stopped immediately till mining leases are cleared by the standing committee of the National Board of Wildlife (NBWL). Summary In 2018, the SC gave no respite to Rajasthan Govt about the Nov. 2017 sand mining ban order. The HC however has allowed it to lift sand from agricultural land. The illegal extraction of riverbed gravels continued all through the year so were the incidents of attack on police officials. The state govt efforts to curb were clearly insufficient. Through the year, SC kept raising the issue of how illegal mining was ruining the rivers and criticised state and central govt for lacking policy to control it. The Feb. 2018 CAG report revealed mining of 98.87 lakh tonnes minerals illegally in last 5 year damaging the environment irreversibly. The year also saw elected lawmakers and govt being ignorant to ecological impacts of sand mining. The BJP MLA from Ladpura openly supported the illegal sand mining in Chambal River. Another MLA Anand Lal Jeengar from Chittoragarh, who is accused of involvement in illegal sand mining in Banas river, was given party ticket in the election. Politicians irrespective of party affiliation are either directly or indirectly involved in illegal mining, hence it was not an issue during State Assembly election in Dec. 2018. The annual demand of sand in the state is around 100 metric tonnes. So far most of it was sourced from the river. The ban has affected the real estate sector and infrastructure development. Govt was seen making some effort to promote the M-sand as viable alternative. JDA allowed use of M-Sand in infrastructure projects. Realtors are also moving to alternative of river sand. In July 2018, the mining department held a seminar promoting the use of M-Sand. Now the Govt is readying the M-Sand policy. However, several issues are involved in making M-Sand. It needs excavation of rocks and gravels as raw material which would affect the environment negatively. The process of production creates lot of noise and air pollution. The obtained sand is than needs to be washed with water to remove the impurities which will lead to water extraction and wastage. Production of one ton of M-Sand cost Rs. 500 which is almost equal to cost 1 ton river sand. So far there are 20 units in Rajasthan manufacturing the M-Sand which as per reports are meeting only a small friction of demand. Quarry owners capable of producing M-Sand are fearing economic losses in setting up plants once the SC ban is lifted. In 2019, one can only hopes that the new govt will ensure pro- environment and river friendly sustainable sand mining practices and wishes it will enforce strict measures against illegal sand mining in Rajasthan.